Main Switch is an electronic primary switch designed for switching of the main power supply (Main Battery) for your RC model. It adds an element of safety when handling the model, without the need to physically disconnection of the main battery pack. The advantage of an electronic switch is that it offers a virtual unlimited On/Off cycles, unlike mechanically operated switches. The Main Switch prevents the connectors from sparking when connecting the batteries, in fact it also replaces Anti-Spark connectors. The Main Switch 100 and 200 are shipped with a magnetic or R3/RSW receiver/wireless switch. 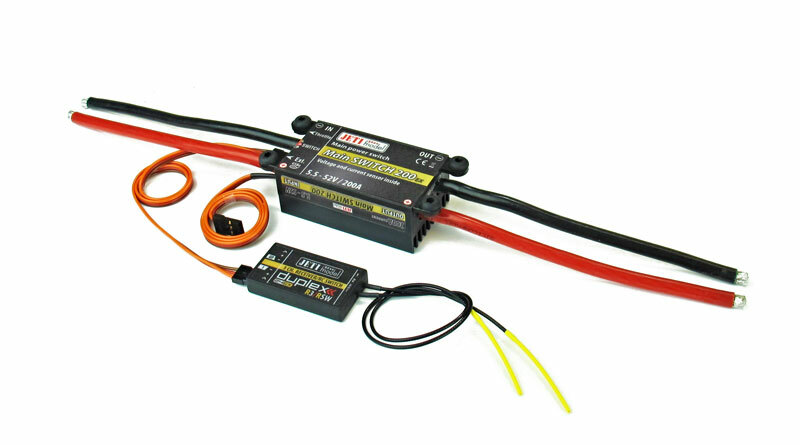 The Main Switch is primarily designed for switching the main battery of the RC model, but can also be used in applications where switching a DC power supply is needed. If main switch is used with R3/RSW receiver/wireless switch the High Voltage Inline Regulator HVR 1W 9.5-59V (Included) must be connected to prevent damage to the R3/RSW due to high voltage input. The Main Switch comes equipped with complete Jeti telemetry. It measure Voltage, Current, Battery Capacity, and Temperature. Alarms can be set to monitor maximum current, minimum voltage, battery used capacity, and maximum temperature. Copyright © 2012 Jeti USA. All Rights Reserved.